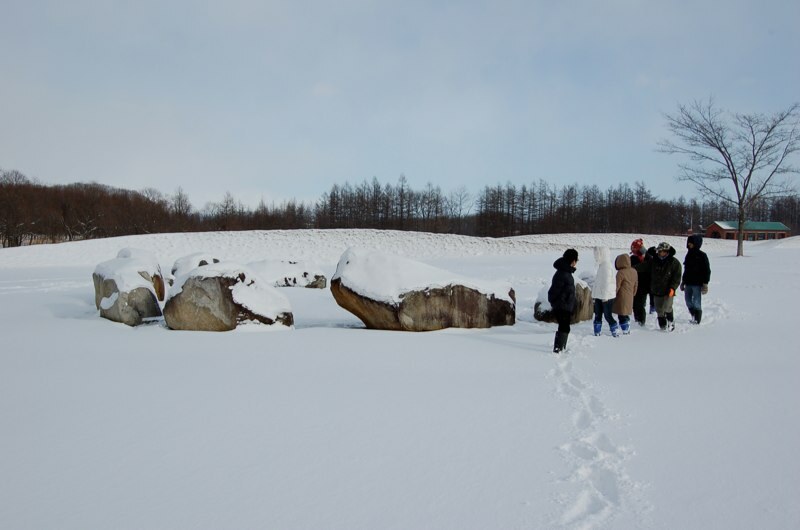 The Honeoppu* River, which runs through Tokachi Millennium Forest, got its name from an Ainu folktale about a war between deer from Tokachi and Hidaka. After a lengthy and exhausting battle, a Kamui (“God”) appeared and brought a reconciliation. Thereafter, the deer carried messages from the God and traveled between Tokachi and Hidaka. The stones of the circle represent the deer from Tokachi and Hidaka, and the stone in the circle is the Kamui (“bone spear” in Ainu). Once upon a time, the god of Mt. Oputateshike (in the Daisetsuzan Mountains) and the goddess of Mt. Akannupuri (a.k.a. Mt. Meakandake) had a quarrel. When Akannupuri threw a spear at Oputateshike, the god of Mt. Nupukaushinupuri stepped between them. The spear cut off a part of his ear, which fell off into the Forest. The big stone represents the fragment of the ear.